If you wish to receive an email notification when updates become available, enter your email address below followed by the Subscribe button. You can follow what's happening by subscribing to the newsfeed and Twitter @Treasury_AU make sure you use #bettertax. You can also participate in the conversation through regular quick comments and quiz. 21 August 2015 The discussion paper on the wine equalisation tax rebate (WET rebate) has now been released. his paper is intended to stimulate public discussion on how the WET rebate scheme may be contributing to distortions in the production of wine and seek feedback on what opportunities there might be to better target the support that the rebate offers. Which tax topics were mentioned the most? 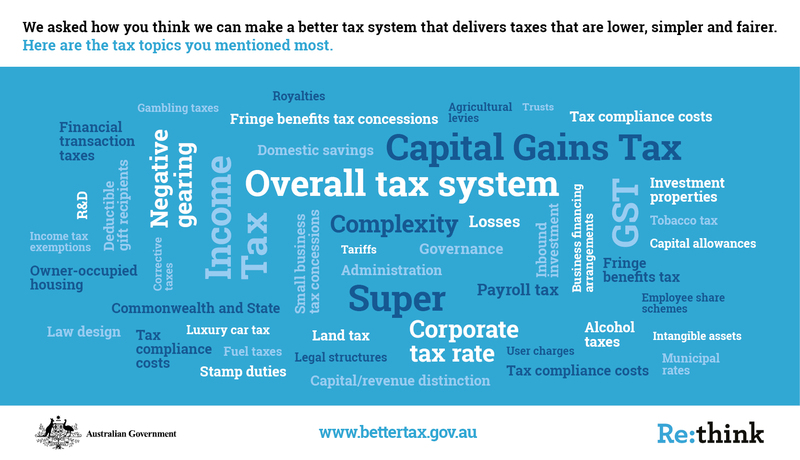 6 August 2015 We asked how you think we can make a better tax system, here are the tax topics you mentioned the most in your submissions. 5 August 2015 Check out our snapshot of organisations and individuals who made a formal submission in response to the tax discussion paper. Help us to improve our services by taking the survey. It only takes around five minutes and will provide us with your valuable feedback. The survey closed Monday 3 August. How did tax get so complex? 22 June 2015 In the 1950s Australia had a tax system made up of around 1080 pages of tax law. Since then, Governments have identified gaps, addressed omissions, and attempted to adapt the tax system to changes in business and society. Check out our in five slides on complexity to find out more. Did you take the taxation of savings quiz? 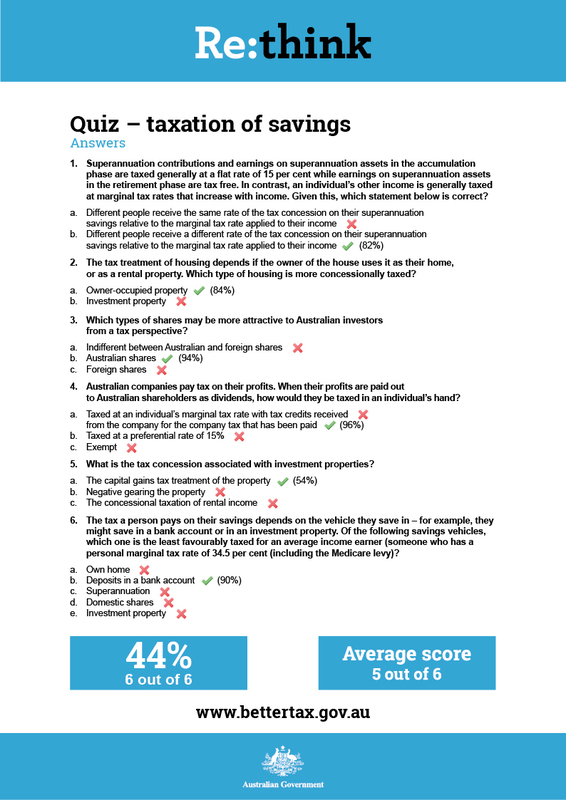 4 June 2015 Did you take to quiz on the taxation of savings? 44% of you got 6 out of 6 questions right for a perfect score. Did you respond to our "quick comment" on the taxation of savings? 4 June 2015 Last week we asked you for your thoughts on whether there should there be differences in the way savings are taxed? Here's what you mentioned most frequently View comments. 28 May 2015 Want to know more about how savings are taxed? Check out our in five slides. 28 May 2015 What is negative gearing? 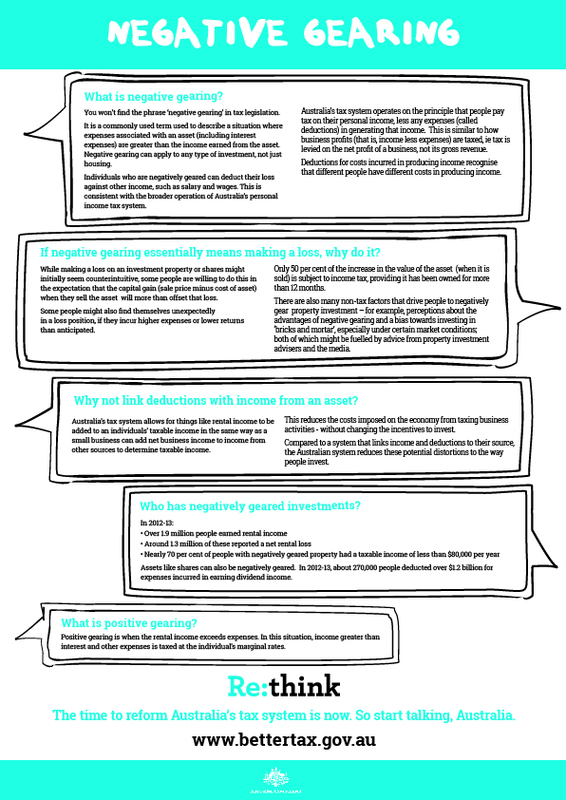 Check out our infographic on the topic. Did you respond to our "quick comment" on tax and economic growth? How can we make the tax system better for economic growth? Quiz answers - who actually pays tax? 14 May 2015 Did you take to quiz on who actually pays tax? The results to date are now in and 54% of you got 5 out of 5 questions right for a perfect score! Speech - looking forward 100 years: where to for income tax? Did you take the quiz? The results to date are now in from last week's quiz. The subject was challenges for the tax system. Here's what you have mentioned most frequently. Did you respond to our first “quick comment”? What needs to change for a better tax system that delivers lower, simpler, fairer taxes? 30 March 2015 What is your vision for a better tax system that delivers lower, simpler, fairer taxes? Lodge your formal submission by 1 June 2015.